ViewModel UserControl is what we call the UserControl that given an ecospace type and a ViewModel name already in design time can derive a UI based on the UI-hints that the ViewModel definition might have, and in runtime, given an EcoSpace and a Root object, turns into a fully bound UI; derived purely from a declarative idea about what you want to achieve. 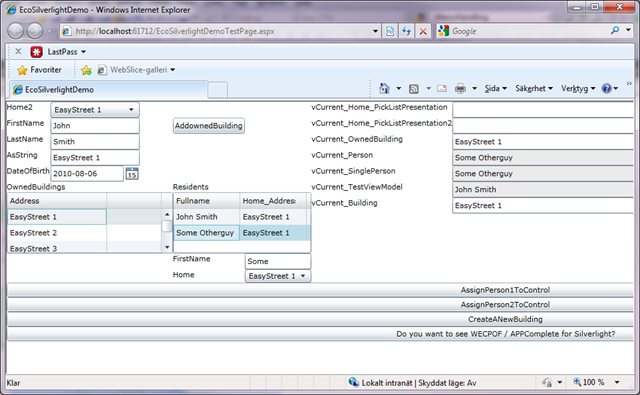 The ViewModel UserControls have different implementations for different UI-architectures of course. I have described the ViewModel UserControl for ASP.NET here; http://theblog.capableobjects.com/2010/02/viewmodels-in-aspnet.html . 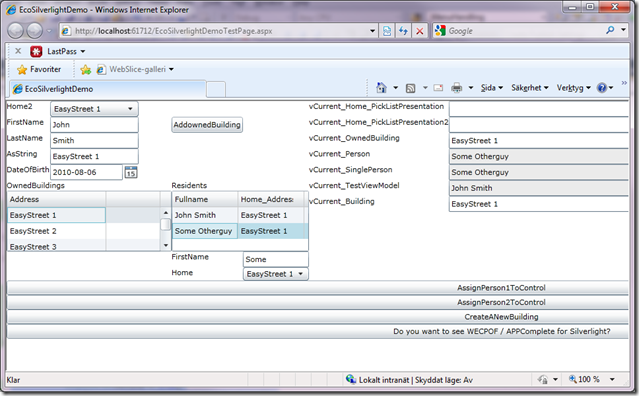 The ViewModel UserControl for WindowsForms UserControl I have not really written anything about – but we use them frequently in Modlr – like in the Actions-dialog. 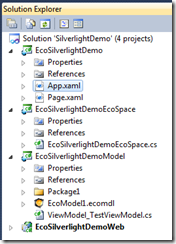 And earlier this week I wrote about the ViewModels now being consumable in Silverlight via generated code ; http://theblog.capableobjects.com/2010/07/silverlight-and-viewmodels-and-eco-and.html in the available beta builds of ECO6 for Visual Studio 2010. 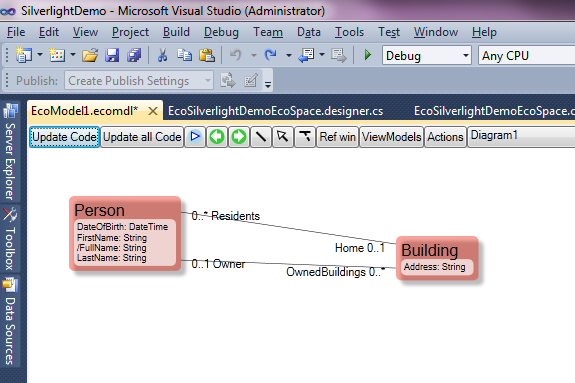 Today we present the ViewModel UserControl for Silverlight – named ViewModelSLUserControl. That we were about to present such a control must have been obvious to everyone but today it is actually here. I wanted to show a somewhat complex sample and at the same time really test the Silverlight implementation of the ViewModel UserControl. So I added comboboxes, and master detail grids in two steps followed by a detailing of the selected row of the last grid in discrete components. I also added columns to the ViewModel for each of the auto created/ auto maintained vCurrent_ variables that comes with the ViewModel. Even if this sort of UI is considered advanced by many standards (never mind the look of it just now) it is easy to produce and maintain in the ViewModel editor. And this is the whole point of the ViewModel UserControls – fast as your thoughts. The interesting part is really what you do with the time you do not spend in the ViewModel editor – the time you have gained by not being forced to create standard UI’s manually, and not needing to maintain them manually. 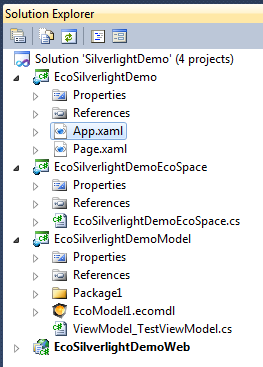 WECPOF / AppComplete for Silverlight actually works! FWIW, in the MVVM pattern, I THINK that your "ViewModel UserControl" would be better called a "View". I have been giving the naming a lot of thought - I know MS calls the pattern to implement a ViewModel for a "Model View ViewModel" or MVVM. 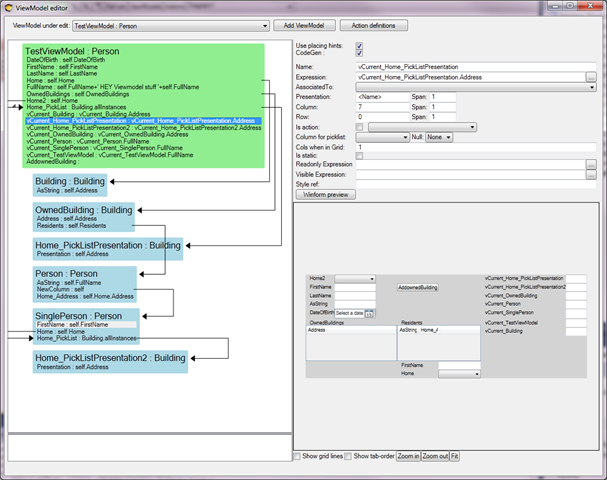 Martin Fowler called it Model-View-Controller. But we all talk about the exact same thing; a View of the model - we mean this in the aspect "not the whole model" and also in the aspect "the model according to me" and thirdly in aspect "the model transformed to solve my usecase or business process step". So the ViewModel is one thing and the UserInterface (UI) is another. That being said it is important to say that the motivation for having a View of the Model and not always use the whole Model is very helpful when building a user interface.